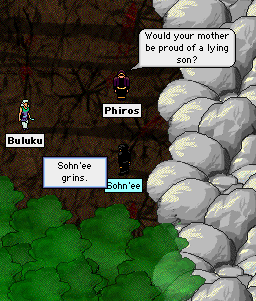 Myself and a few companions set out to speak with Sohn'ee, who is currently located on Thieves' Island. Although he is very reluctant to speak about the true nature of the Shadowguild's business, he did seem interested in setting up their organization on Puddleby Island. 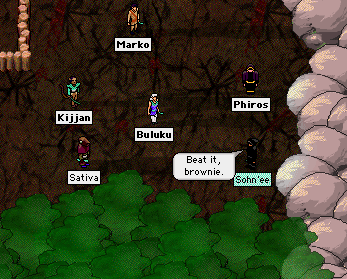 Perhaps more interesting, when Sativa arrived on the scene, Sohn'nee instructed him to, "Beat it, brownie." He went on to say that his job was to keep Sativa out. Sohn'ee further stated that he will keep in touch, and set up a meeting with his boss. It may raise more questions than it answers, but I felt the citizens of Puddleby should know. Attached are a couple visionstone sketches. It's true, Sohn'ee was told to keep us out. We puddleby Shadowguilders are trying to poach Nylar's men and he's on to our plan. We offer them an alternative to murder, and they will join us. But in the mean time we may have to battle Nylar for this privilege. When the time comes those who support a Puddleby Chapter of the guild will have to decide what they want! Arr should I likes... just challenge Nylar to a duel or something? Cuz I'm pretty sure I could win. So he is not allied with Shadowguild, but calls his new guild by that name in the anticipation that he will soon take over the Shadowguild? 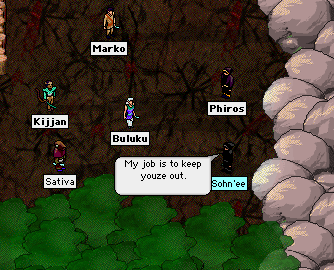 Sativa seems to have chosen a dangerous course, tying the fate of the mystics who support his movement to his aim of taking over a new and dangerous force which has a considerable informational advantage over Puddleby. This movement seems to have less to do with mystics every day. My understandin is thar be members of the Shadowguild that want to join us and others that don't. Yes, it has to do with mystics, and yes it also involves non-mystics. How many chances do we ever get to take over a semi-hostile faction in tha island chain? I thinks we should support this to our fullest extent. Ye too can be a part of this and help guide tha actions we collective take with or against tha guild. I claim leadership of the Shadowguild, but Nylar does as well. I have personal knowledge that the members of the guild weren't always criminals. They used to be good folks, and Nylar is manipulating them. Our chapter of this guild offers them refuge, and by doing so we will weaken Nylar, and gain the secrets of their members. This all hinges upon what we learn from our next meeting with Nylar, and this indeed will happen. I hope we all are prepared for what he has to say!